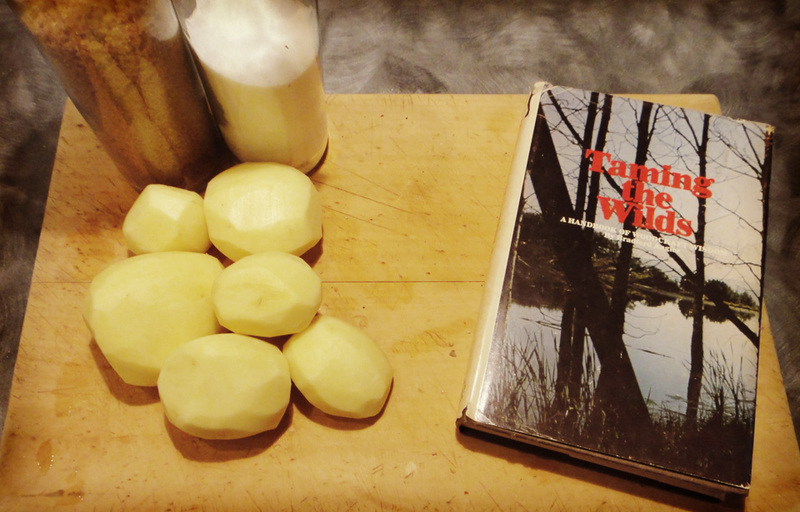 I first saw this recipe on an episode of River Cottage, it looked amazing but I think that Brandt Berglund and Clare E. Bolsby have trumped Mr. Fearnley-Wittingsall with this recipe from their 1976 publication - "Wilderness Cookbook." Planked fish was often used on the trail by scouts and early settlers. The method is simple and needs little attention while cooking. Split a log a little larger than the spread of the fish. Rub some bacon fat or bear grease on the plank and prop it up vertically in front of the camp fire. Clean the fish and remove the head and tail. Split the fish open and place it skin side down on the preheated log. Tack the fish down along the edges of the skin with wooden pegs. Season the fish and smear some grease or bacon fat on it. Place the log vertically in front of the fire and let cook. Baste the fish from time to time; it makes the meat much juicier. The fish should cook in about 20 minutes, depending on size. Check the fish occasionally. When the meat is flakey and tender, remove from the head before it breaks loose from the skin and falls into the fire. When I tried this method of cooking, I did a whole side of salmon on an offcut of wood. I didn't have any wooden pegs so I used regular nails, and I was fresh out of bear grease so I used butter, a little olive oil and some herbs. I also put a cast iron pan beneath the plank to catch all the goodness that came out which I used to baste the fish and pour over the meat when finished. It took a little over 20 minutes, but it was a big piece of fish. The finished salmon fell away from the skin and was succulent and moist. Incredibly straight forward and extremely delicious. 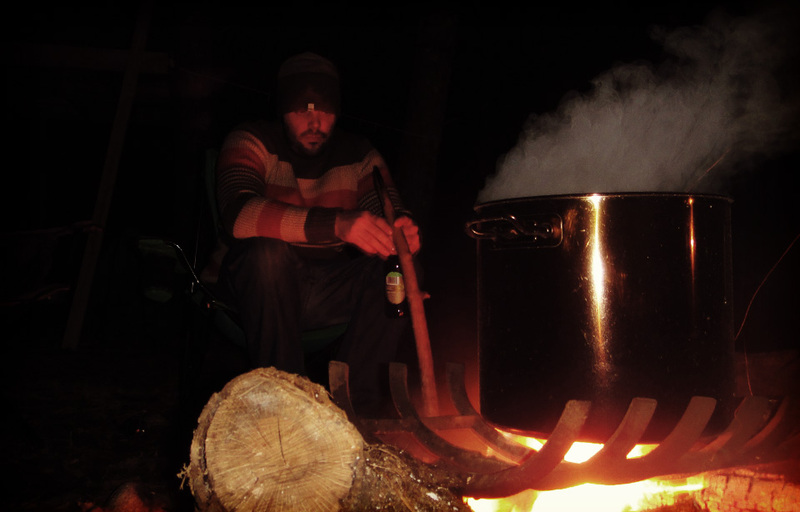 Posted on September 16, 2014 by Kevin Phillips and filed under Recipe and tagged planked fish plank recipe fish salmon campfire cooking. Stew is one of my staple outdoor dishes; it's very hard to mess up and the results can be spectacular. This time however, I wanted to up the stew ante and nudge my culinary comfort zone a little further by taking on the mighty dumpling. I cooked my stew on a campfire in a suspended Dutch oven, it needs to cook for several hours so make sure there are sufficient coals. I started with a big hot fire with slow burning wood and let it burn down. You can, of course vary the height of the oven and even cover it in coals if the heat is needed. 1. Lightly heat the Dutch oven and add the oil. Sauté the onions, do not let them brown - they should soften and go translucent. 2. While the onions were cooking, I put the sausages on a rack directly over the flames to seal and brown the outside. They don't need to cook through as this will happen later. I managed to tilt the grill in such a way that the oil and juices went into the Dutch oven for extra flavour. 3. Once the sausages are browned add them to the onions and pour in the stock, beer and cider. I added a good spoonful of thyme and a few good glugs of Worchester Sauce. Give it all a good stir and bring the oven to the boil, cover and simmer for 45 minutes. 4. By now the broth should be coming together nicely and slowly reducing. Add the vegetables and return the stew to the heat, give it a good stir and cover, then cook for another 30 minutes. Mix up the dumplings. 5. To make the dumplings, pour the flour into a large bowl, add the butter and rub it in until it resembles breadcrumbs. 6. Add the herbs and the egg, and mix with your hand, adding just enough milk so that the mixture comes together in a sticky dough. 7. Check the stew, it should have reduced considerably making a thick, rich gravy; if it is too dry add a little water or stock. Give it another stir and then add large spoonfuls of the dough directly onto the top of the stew. Try and place them a few centimeters apart as they will puff up as they cook. Replace the lid on and cook for another 15 minutes. 8. Check the stew. The dumplings should have puffed up and increased in size and the stew should be thick and rich. I prefer the top of my dumplings to be crispy so I buried the Dutch oven in coals and blasted it for another five minutes. 9. Then it is done. Serve quickly and eat heartily. The stew is hefty and flavorsome, the dumplings sticky, doughy and morish. Shared between two we were both stuffed and had enough for lunch the day after. I'm not sure why I was so fearful of campfire dumplings, they were foolproof and a simple way of getting a delicious and filling bread course to my stew, with little effort. 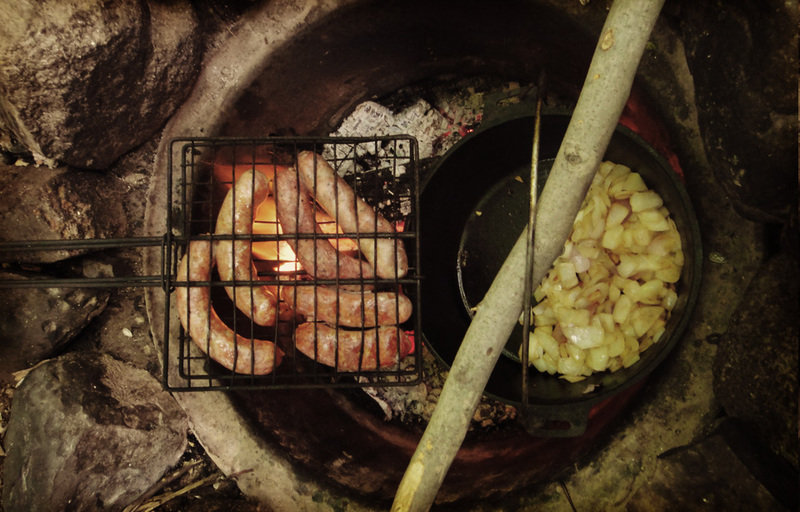 Posted on July 6, 2014 by admin and filed under Recipe and tagged campfire cooking cooking dumplings dutch oven recipe sausage stew. This is my second attempt at documenting my campfire cookery. The dish is a little ambitious but worth the effort as there is nothing better than curry made from scratch. This particular recipe is loosely based on Pat Chapman's pragmatically named, yet delicious – "Medium Curry, Restaurant Style" from "The Indian Restaurant Cookbook," published in 1984. Chapman is, in my opinion, one of the leading authors of Indian cookbooks and a champion of the English restaurant style of curry. The beauty of this dish is that all of the more complicated components can be made in advance; the spices can be mixed and a simple onion purée can be made at home before you head out to camp. Roughly chop 10 onions, 20 large garlic cloves and 100g of fresh ginger and lightly fry in 300ml of vegetable oil over a light heat. This should take about 15 minutes; they should turn translucent but not brown. Purée the fried mixture and let cool, then fry for another 15 minutes with another 300ml of vegetable oil. This will make 10 cups of purée, which can be frozen for future curries. This is a baked curry so you will need a Dutch oven and a good bed of coals for a long slow cook. Build the fire big and hot and let it burn down to good cooking coals. Put on the Dutch oven lid and bake for 45 minutes at a medium heat (375°F, 190°C). I cannot help giving it a look every 15 minutes but if you feel you have the heat just right then leave it longer. This should be a dry-ish curry but if you feel it is going to burn add a little water. Serve with rice and flat breads. The curry was spicy and rich, with tender chunks of chicken and enough sauce to mix with the rice. I've tried this dish at home with lamb, which was delicious, but the fire smoke and the outdoor surroundings certainly added new level of flavour to the curry. The "The Indian Restaurant Cookbook" appears to be out of print now. It's not too hard to come by a second hand copy and is worth snapping up if you find it. Posted on June 4, 2013 by admin and filed under Recipe and tagged campfire cooking Campfire Curry curry dutch oven Pat Chapman recipe. We did it, we made our own maple syrup! Myself and the Mrs we're invited to New Hampshire to spend a day (and a lot of a night) making syrup. We had a fantastic time. While I'm sure most serious syrup makers would frown upon some of the finer points of our process, we gathered sap and boiled and bottled our very own syrup. 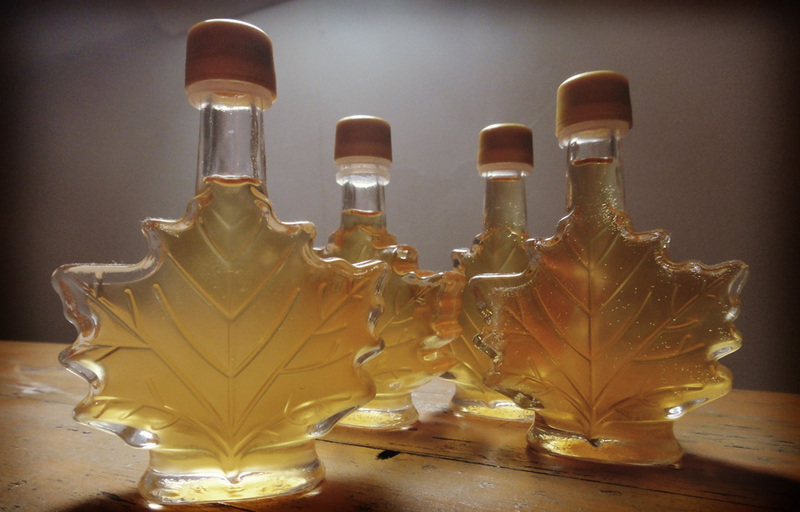 This was put into the token, sterilized, maple leaf shaped bottles and left to cool. An initial tasting was unlike any syrup I've ever had. It is often said the real deal is a million miles from the store bought stuff, and while we do buy local Maine syrup, this was indeed very different. Unmistakable as maple syrup but with a caramel taste to it as well. Lighter in colour and a little less brash, it is fantastic and will be treasured through-out the year. Big thanks to the Nimmos in New Hampshire for showing us the ropes and letting us take more than our share of the finished product. I can't wait to do it again next year. Posted on March 19, 2012 by admin and filed under Recipe and tagged fire maple maple syrup New Hampshire recipe. 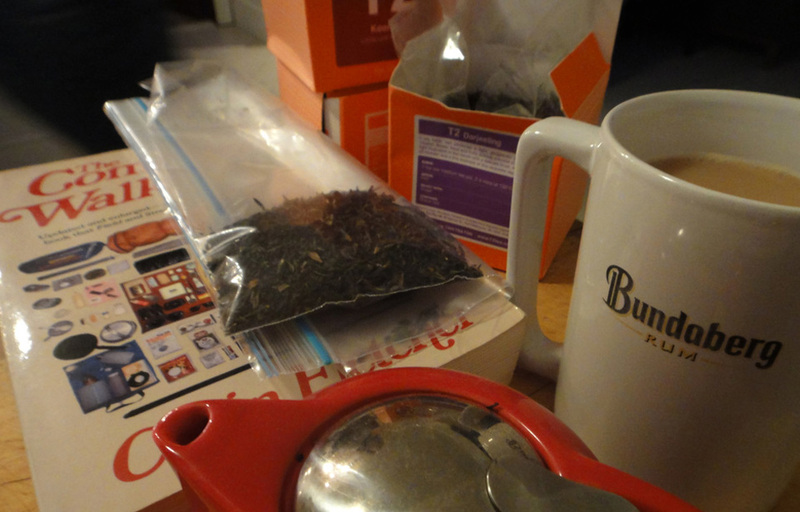 This is a tea story I've been looking forward to posting but has taken a little preperation. As a British ex-pat Colin Fletcher upheld the "Britanic Afternoon Tea" ritual despite having lived away from Blighty for more than a quarter of a century. In "The Complete Walker Pt. 3" Fletcher details his approach to tea and hiking. Fletcher goes on, in his unique and entertaining way, to detail the use of both tea, coffee and cocoa. He quotes a paper by the Addictions Research Foundation of Ontario.This gives the hard line on the effects of caffeine. Fletcher however jumps to the defence of tea calling coffee and cocoa "mere foods" and "such calumnies against tea are enough to depress the mood, if not the performance of an Un-British Activities Committee"
In weighing up the pluses and minuses of loose leaf vs. tea bags vs. tea powder he provides a recipe for a blend given to him by "a lover of tea and a hater of tea bags"
This I had to try, I sourced the various teas and the blend is complete. It's a delicious hearty black tea- a no-nonsense blend. I am a big fan of Russian Caravan Tea and this is similar with Keemun and the dash of Lapsang Suchong but the Celyon gives it a lighter edge steering it a little closer to an English style tea. I was so impressed I've made a full batch if anyone out there is interested in trying some shoot me an email and I'll figure the best way to get it out to you. Posted on January 12, 2012 by admin and filed under Tea and tagged Colin Fletcher recipe Tea The Complete Walker. After pack weight, trail food would have to be one of the most talked about hiking subjects. I am fascinated by the creative recipes written in older hiking books. The most interesting come from a time before commercial hiking food, when hikers managed with some fresh produce and dry staples, adding to their larder by hunting and gathering. Most recipes are fairly predictable rabbit stew, fish, beans and breads. There is one recipe, however, that stuck in my head more than any other. 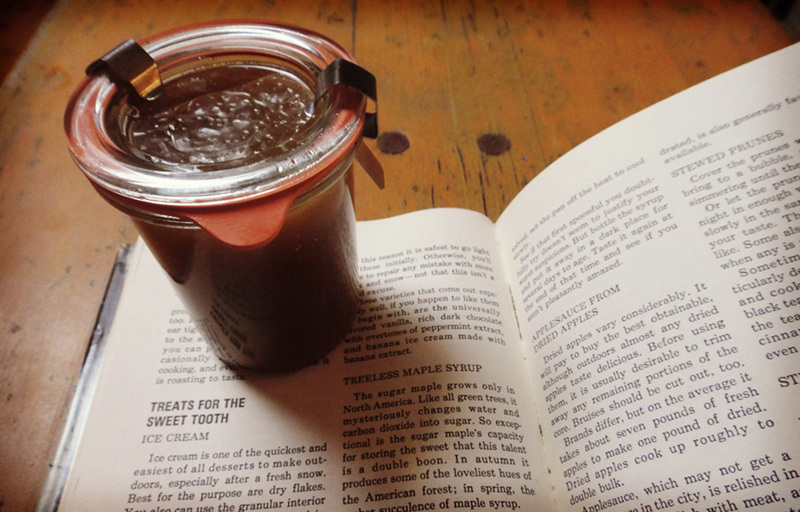 Treeless Maple Syrup from Bradford Angier's 1967 publication "Taming the Wilds." This recipe is for those living outside the North East who do not have access to maple trees. It can then be bottled. Being a newcomer to New England, and not having had the chance to make my own maple syrup yet, I thought I would give it a try. I'd love to report it was incredible but as per Angier's instructions I am leaving it to mature. An initial tasting was accurate to Angier's prediction, realising my "worst fears" flavour wise. He advised placing it in a dark place for several days the results of which he promises will be surprising. I shall report back once ready. Posted on November 13, 2011 by admin and filed under Books, Recipe and tagged 1960s Bradford Angier cooking maple syrup recipe Taming the Wilds.